Thai Adventure - Part Deux. The Tri-Fest in Phuket is held over 2 weeks. There is a super video here which shows you just how incredible this race is from 2012 when it was an Ironman branded race. The first race is the ‘Race of Legends’ - Laguna Phuket Triathlon (LPT) so called because so many of the sports' top athletes’ have raced it at some point in their careers. This year was the 20th anniversary. LPT is an extended Olympic distance race - although always feels far longer! Swim - 1.8k split between a 1200 swim in the ocean -beach run in start - and 600m swim in a ‘fresh’ water lagoon. Bike - 55k - Very hilly to start - with some 18% gradients and then technical with some stretches of TT flat thrown in. Run - 12k around the Laguna Phuket resort and through the Banyan Tree Golf Course. For me - I went into this race still pretty unwell from a stomach bug that had knocked me out for a few days in the lead up. I drank my body-weight fresh coconut juice in the lead up to replenish electrolytes, rested, upped my probiotics and went on the hunt for a Glutamine supplement to help support my immune system and gut. I definitely felt a lot better come race morning - but perhaps misguidely took a sedative antihistamine the night before the race to help me sleep & to reduce the itching from mosquito bites. Probably would have been ok, if the race had started at 10am but not 6.30am. I was very groggy and hoped my usual pre-race caffeine tabs would kick in and wake me up. Also I had very little in the way of pre-race nerves - i mean it IS Thailand after all - pretty difficult to get worked up. 6.30am race kick off - there had been torrential rain in the days preceding the race so all eyes were on the skies and praying that it would stay dry. Everytime I have raced in Phuket it has rained and it definitely ups the adrenaline on the bike course as the hills and corners become very sloppy - not to mention the fact that i have been up to my knees along sections of the bike course before. The atmosphere pre-race here is incredible - My favourite commentator of all time - Whit Raymond - knows how to work a crowd and the music base echoes along the laguna beach shores! Race Organisers treat us Pro's well here! We started with the pro-men in this race which usually means the bun fight for the first 100-400m. I tried to keep a bit out of the way but actually it was pretty spread out. I swam out pretty well and managed to avoid getting too pushed back by the waves. I was soon out on my own though - not quite sure why - perhaps testament to the residual effects of the anti-histamine - i was just too damn relaxed!… Then there were two people on my feet, but i had no idea who they were until I hit the shore-line.. i managed to create another gap from them - but coming into the shore i went too far left and Belinda and Mel H - both Aussie and thus i assume pretty good at body surfing - Mel told me they caught a good wave and then we were all back together. Onto the shore and its a 200m run over a hillock on the beach into the lagoon. It was then i got to see who i was with an was surprised to see Belinda behind me (and Mel). 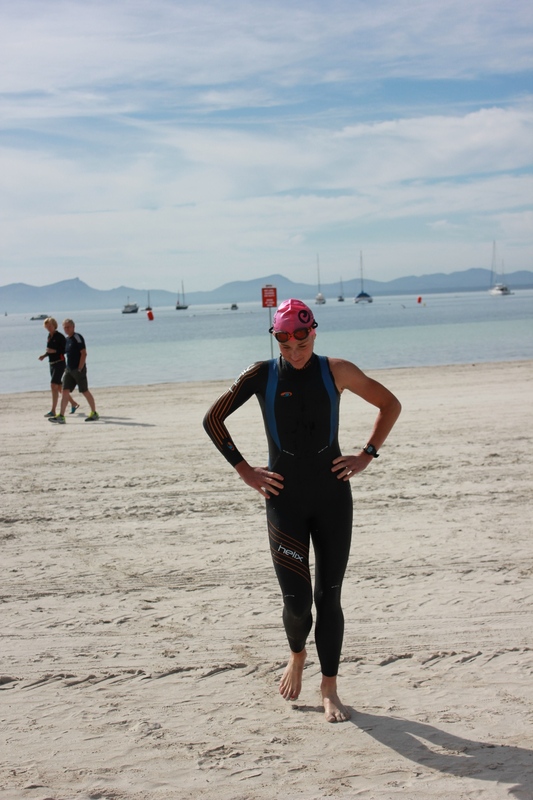 Belinda has come out of the water in this race 2-3 minutes ahead of me previously - so I was happy with this. Then dive into the lagoon and that sinking feeling. Here Mel took the lead - boy does that girl kick! In contrast to me - as Belinda said - I am so easy to draft because of my light (borderline lazy) two beat kick - compared to the motor-mill leg kick of Mel H.
We stayed together through the lagoon (I do not want to think about what is lurking that water - but many people became sick post race and blamed race lagoon-water consumption). Into T2 and I started to wake up a bit…I was in a good position. Out on to the bike - with far too much faff time in transition, as I dropped my water bottle - Belinda and Mel had got away - so I knew I had to catch up to stay in contention. Immediately on the bike i felt very sick. I thought it would pass - the sea had been a quite choppy and I had swallowed some… but nope.. it was sitting there. I pushed on legs feeling quite strong and I caught Belinda a few miles up the road. Then almost as I did I felt very sick and leaned to the side and was sick. Not just a little - but a lot… Belinda then caught back up and asked if I was ok.. Stomach wasn’t but legs felt ok, so I pushed on… nausea persisting despite vomiting. We then hit the hills and pushed on over and I lost sight of Belinda behind. Then I turned the corner and could barely believe my eyes - it was Macca! Now this is perhaps one of the only times in my life that I will ever pass Macca on a bike (he’s been unwell with Glandular Fever and was out of shape)… he was very encouraging and said - “Mel is just up the road - like 400m - go get her!”. Now this put wind in my sails as I remember from last year that Mel had come past me on the bike in the first miles like I was going backwards - like a machine. I now I was actually catching her a bit on the hills. I got her in my sights and kept her there. I am rarely in the situation on the bike where I am in close proximity to someone on the bike - at least for big sections of the bike course in a 1/2 ironman. It used to be that the Age-Group men caught up with us - but in most races they start them 15-30minutes behind us now which means that the race is far more fair. (and is one of the reasons why you CANNOT compare Age-group and Pro time - especially with the women - as we are so spread out and have minimal/no draft effect). ‘i can’t hit the numbers.. its not my day and start questioning why you can’t hit the numbers and what you’ve done wrong in your prep - instead of focusing on what you CAN do in the here and now to race the best you can with what you’ve got. I could see my power numbers were up on the climbs - they are that steep that for me its hard to actually get over them at any speed at all at less than 300W (i’m 55-57kg).. but they were variable on the flatter/roling sections - so i chose to ignore it and switched my 910XT to speed and time and focused on keeping Mel in my sights. Then Macca caught back up and was behind me for a good while - I could hear him shouting at me occasionally when he saw me dropping back and letting Mel get away. Then the sickness hit again - (I had been trying to sip my gel/water/sodium mix but my stomach wasn’t having it)… so I slowed down and was sick again… a few deep breaths and then I pushed myself to catch back up to Mel and Chris (Macca) who was now ahead. I could see them perhaps 50m down the road - (the draft zone on this race is a mere 7m) - but i couldn’t catch up - even pushing 220-240w for a period of time - but I did manage to keep them in my sight line until we hit the last 5k of technical course through a town and some trucks got between us. I started to feel tired at this time and not being able to take anything on - and heading into the race relatively depleted (glycogen/fuel storage wise).. I took another caffeine gel but instead of swallowing I just kept it in my mouth as long as possible, hoping for some sublingual (under the tongue) absorption that wouldn’t tax my stomach - and then spat it out. The final km’s on the bike I started to think about how the run would go and where I was in the race. I estimated that Mel had got a few minutes ahead and I then saw Radka Vodikova (ITU athlete/Olympian and previous winner of this race x 2).. as we came into T2. Now, on a good day, I am confident that I can run with Radka, perhaps, head to head even out-run her - I had been running well in training in the lead up - but as soon as I dismounted the bike I felt tired and literally like I wanted to curl up and go to sleep. So much for that 200mg of caffeine! Goes to show - if you are low on carbs and electrolytes - running at threshold Oly distance pace - ain’t going to happen all that easily. So I resigned myself to just getting through and settling for 3rd. I could see Beilnda was a fair few minutes behind and knew if I just ran aerobically for 12k I would get to the finish line in 3rd place. So I took it all in, and smiled at the spectators and the elephants and sipped coke through the 12k. Over the finish line and I started to feel a bit woozy - light headed and nausea - but I managed to get through the podium presentations (not camera shy me ;) Then as I went to get a drink one of the nurses from the Thanyapura clinic who was working in the medical tent saw me and said i looked very pale - so she took me in at did my blood pressure and pulse etc. 88/45 with a pulse of 48… not really what you expect post racing for 3 hours - 9-12hours yes - but 3 hours! She brought the doc over and they hooked me up to saline drip and gave me some paracetamol to soothe my throbbing head (dehydration - did I mention you sweat ALOT in Phuket - and I had taken on very little during the race)..
1 hour later and i felt better. Funny thing was - picking up my bike - my legs didn’t feel like they had raced at all - and it made me think - if you jog (relatively speaking) the run and stay within yourself - your muscles are not going to be inflamed like they would be if you are on the limit for 12k. 6 days until the next Challenge which was to be the Half Iron distance - Challenge Phuket. Now instead of making the most of some down time - i made the most of riding my bike in the sun!